Jeanie Keogh spent some time on a delightful Portuguese island. Madeira’s seductive nature lulls and entices like the island of Sirens did Odysseus. A majestic volcanic rock of some 700 km2 juts proudly out of the sea 900 km from the coast of mainland Portugal and 590 km from the coast of Morocco. Arriving, you feel you’ve been enveloped by a thriving micro-culture of charming customs. What awaits discovery are: world-renowned Madeira wines, sledding down hilly streets in monte sledges led by carreiros shuffling and steering with felt-soled shoes, dense spice sugarcane honey cake Bolo de Mel that must be broken and not sliced for reasons to do with preserving the colour and texture, the honey/rum-based party drink poncha and funny traditional hats that resemble the Teletubbies headpieces which give the locals a spritely air. After a harrowing landing at Funchal airport (it is one of the most difficult runways at which to land), getting into Funchal takes 30 odd minutes. Once there, check out the vibrant local market with flower sellers in their Madeira finery and fish mongers displaying a cornucopia of the sea’s offerings. Close to the market is the street with the painted doors, a creative tribute to the 2010 flood. A short walk away you’ll find the docks where you can jump on a boat and go on a dolphin safari. 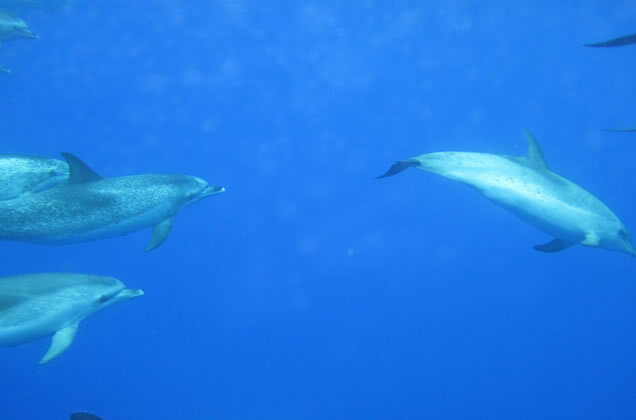 Rota dos Cetaceos tours guarantees that if you don’t see dolphins you can go on a second trip free of charge. Nearby is the cable car which takes you up to the tropical gardens of Monte. If you come in for the weekend, there is enough to see and eat in Funchal to keep you occupied and sated. 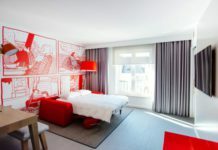 More so if you stay at the design hotel The Vine in the centre of the city, which boasts a 360-degree view of the city from the rooftop bar and pool, and book a vine therapy session (a massage which includes wine… very Bacchic sounding). If relaxing is the name of the game, go for a stroll along the waterfront, look for the mini Sydney Opera House-like tents and park yourself under them for some famed scabbard fish or tuna steaks at RISO and take in the breathtaking coastline views. Driving out of the city, you’ll pass staggered vineyards and banana plantations as you wind around cliffs. If you head inland instead of following the coast, the steep ascent will take you up through the grey-green dappled light of eucalyptus forests until you pass the tree line where there are incredible vistas of exposed crags and, way down below, the feathery line where sea foam meets the shore. It is a stellar place for hiking as there are short walks along levadas (man-made waterways) or longer hikes that link up so you can traverse the whole island if you felt up for a multi-day journey. Our highly knowledgeable guide from Mountain Expedition took us to Pico de Areeiro (traveller alert: bring a jacket, it’s chilly) to a lookout where you can see the highest mountain, Pico Ruivo. He also plucked native fungi off a tree and encouraged us to take some home for their healing properties. Indeed, it makes quite a delicious, refreshing tea. For the more extreme sports and adventurous types like trail runners, paragliders, mountain bikers and climbers, the island is an unpopulated haven. Madeira hosts a yearly ultra trail marathon race, purportedly one of the most challenging in the world, that this year will draw over 1,300 runners. Depending on what you look for in a vacation, the greatest appeal is that Madeira island proper does not have sandy beaches. For some, the upshot of this that it isn’t overrun with the twenty-somethings party crowd, making it a brilliant getaway for couples, retirees and families. For those who like the sensation of finding sand in every nook and cranny of the body, neighbouring Porto Santo island is the place where you can find particle grit galore. It is but a short two-and-a-half hour ferry ride away. But with or without sand, there are some great places to swim on Madeira if you want to get your mermaid/merman on. The most notable are the natural pools (aqua natura) at Porto Moniz on the northwest side of the island. The ocean waves splash over the break-wall and pool in a man-made reservoir. It’s a lovely place to beach yourself and listen to the surf crash. As for places to stay, there is an hotel just above the natural pools with a great, if small, restaurant and reasonably priced rooms, all of which overlook the ocean. Admittedly, the weather on the north side of the island can be patchy, so sun chasers should be forewarned that here is not the place to work on your tan lines. In Calheta, there is a new gem of a concept hotel that opened this spring and it is, in itself, a holiday destination. The Saccharum hotel, interior designed by Madeira’s own Nina Andrade Silva, is a veritable, self-contained paradise. Silva has incorporated into her design elements of the sugar cane factory that used to stand but a few hundred metres from where the hotel is tucked into the hillside. (Wouldn’t you also like to know that back in the day, Madeirenses used to trade sugar for Flemish paintings). The Saccharum is rated 4-stars but is easily a 5-star establishment. The suites are mind-blowing but even the standard rooms impress with understated swank. The spa is quite state of the art as well, and, as part of an early-bird special, it’s free until the beginning of next year. There is much more to say about this enchanting island and it’s down-to-earth, friendly people but that would ruin you discovering its delights for yourselves.